A graduate of the fantastic Fashion East initiative, Michael van der Ham has been working away refining his art and steadily gaining momentum. His spring/summer 2015 collection feels like the culmination of a lot of hard work over the last few seasons. 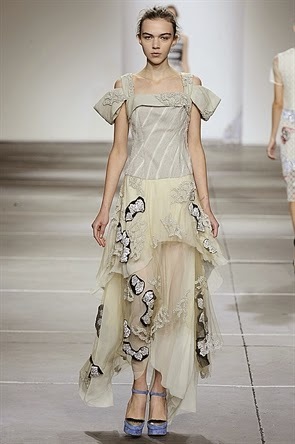 Cohesive and seamless, he found his signatures and really heightened them in a very commercial collection. Focusing heavily on his signature collage layering, his custom designed fabrics were layered mixing florals, jacquard and baroque in wisps and ruffles of light silk. An exploration of texture, Michael used fraying, shredding, 3D floral jacquard and ruffles to counteract the sleek lines of his collection. A refined, riot of fun.